At some point after the It’s Today! 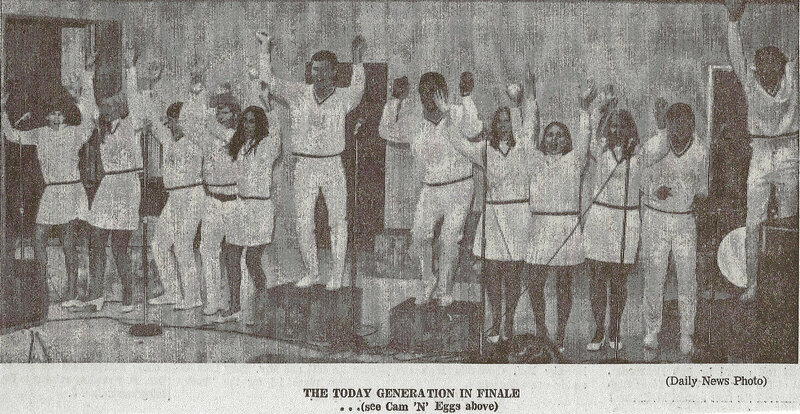 concert, the Choraliers became the Today Generation. 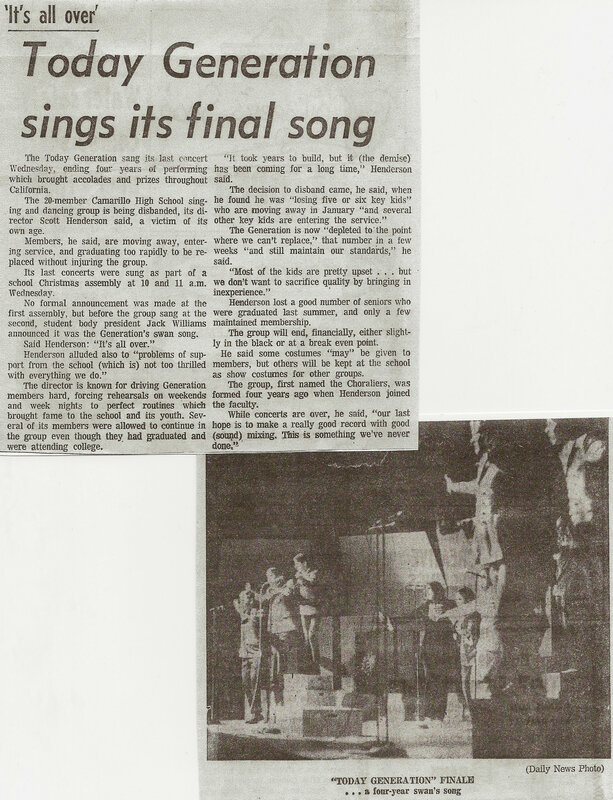 In October, 1968, we entered a competition that took place at Knott’s Berry Farm, called the Festival of Sounds. 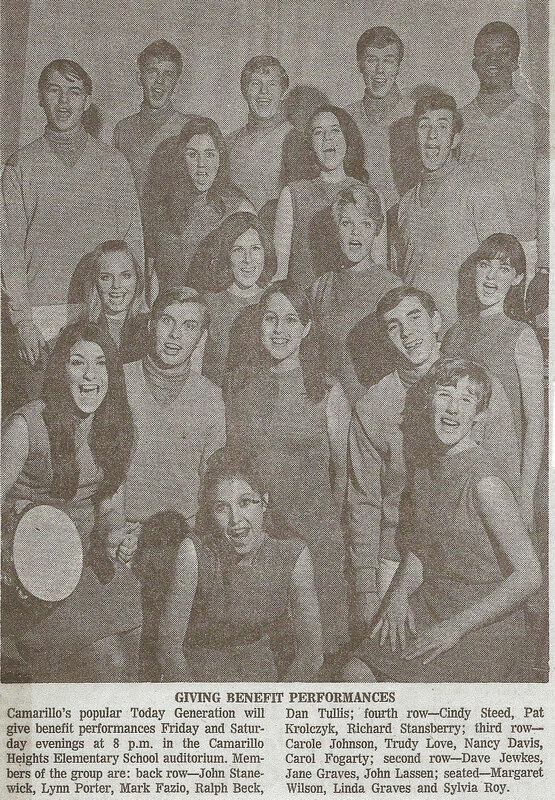 There was a lapse in time as other groups throughout California also competed on the weekends for the chance at the big prize – $1,000 (remember, this was 1969) and claim to the title of best singing group in Southern California. We got very serious with rehearsing; learning new songs and choreography; practicing, practicing, practicing, during and after school and even in the evenings as the next competition got closer. We also had school, and other choir concerts to prepare for. There had been some changes in the make up of the group as well. Carolyn Farrington graduated early and left the group. Mr. Henderson discovered a fabulous singer in Santa Barbara, Nancy Davis, who became part of our group. 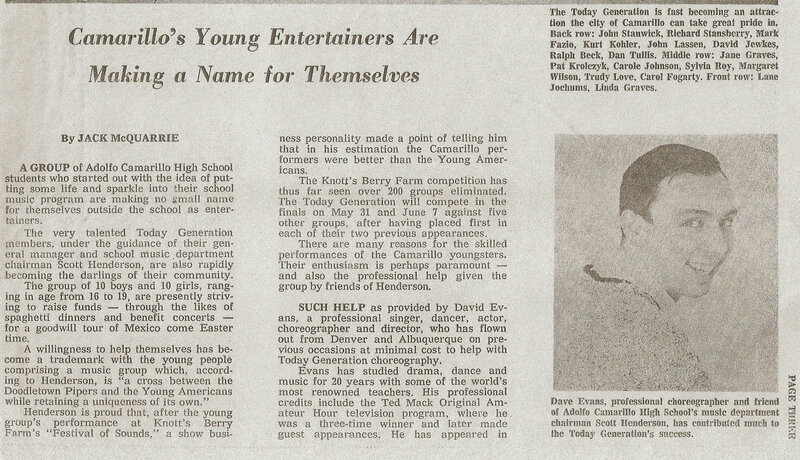 Carole Johnson, Carla Balsbaugh, and Kurt Kohler also joined the Today Generation around this time. Meanwhile, Mr. Henderson started thinking about and planting in the minds of the high school administration and the community at large the idea of a “Goodwill Tour” of Southern California, Arizona and Mexico for us. Naturally, all this would cost money so we had to have more car washes, pancake breakfasts, spaghetti dinners, and benefits to raise the funds. I could hardly wait to get to school in the morning, but not because of classes. It was to find out what was going to happen next with regard to our performing. I loved it all. So what happened with the Festival of Sounds? We won the semi-final and yes, the final competition. Wow, was that exciting! Check out the Knott’s Berry Farm Competitions. There were those among us that were absolutely essential as part of the team, although they did not get the notice or press that the rest of us performers got. Dorothy Whitaker was our faithful accompanist who was there at every single rehearsal and performance, and was as much a part of the group as any of the rest of us. We definitely couldn’t have done it without her. Bob Boles was our sound technician from day one, and we were absolutely dependent upon his expertise to make us sound our best. Cheryl Dalby was our stage manager and resident mother hen who loved being a part of the group, but who knew when to push (and yes, nag) us to make our performances successful. 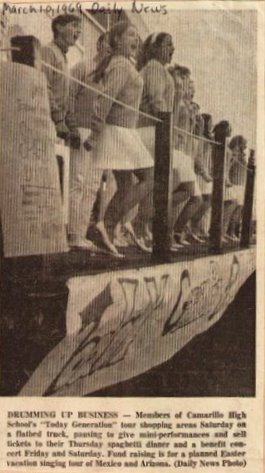 There was so much going on in the Spring of 1969 that I’m hard pressed to keep it straight. 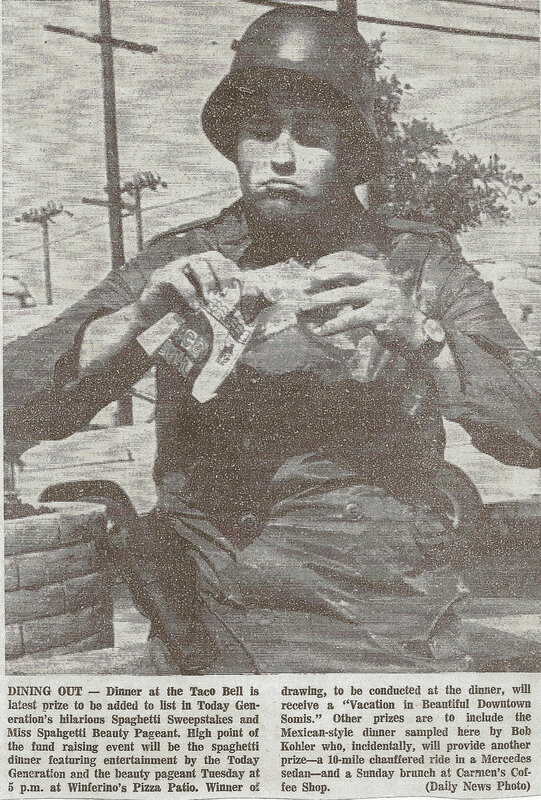 We were rehearsing for the Festival of Sounds competitions; planning and rehearsing for a Goodwill trip; trying to earn money with benefit concerts (which we also had to rehearse for), spaghetti dinners, and car washes. And, oh yeah, attend school and get our homework done. 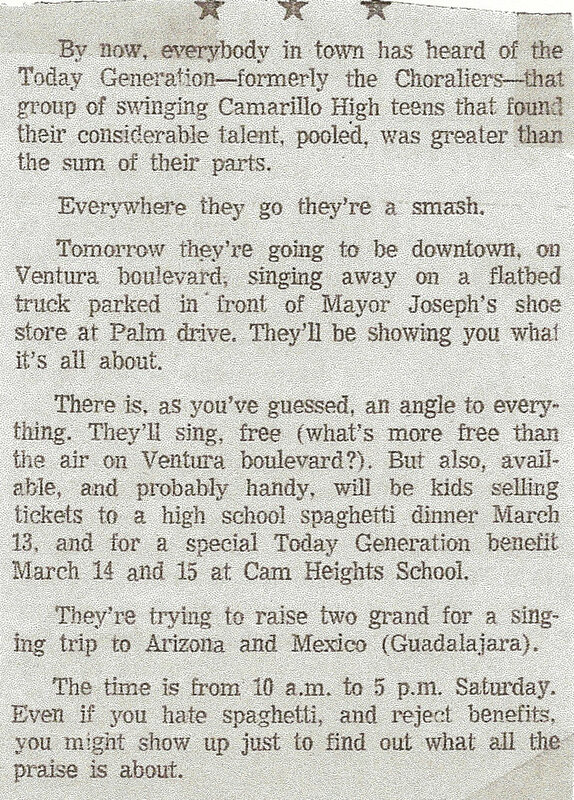 We performed on a flatbed truck in downtown Camarillo one day to try to get people to buy tickets to the spaghetti dinner we were having to earn money for the trip to Mexico. We were also giving a concert at Camarillo Heights school – A Festival of Stars!! While our white pleated skirts and blue sweaters (and dickies) were standard fare for many of our performances, we also had a great selection of costumes, including at least two for the girls that were designed by Violet Palmer (Hollywood studio designer). One was the red and blue dress, and the other was an amazing Edwardian velveteen pants suit, complete with lace at the color and cuffs. We were each fitted for our pants suit, which came in one of three different colors (colors of the era – gold, avocado green, and a lighter, lime green). The guys, in the meantime, wore double breasted jackets that coordinated nicely with the girls’ outfits. 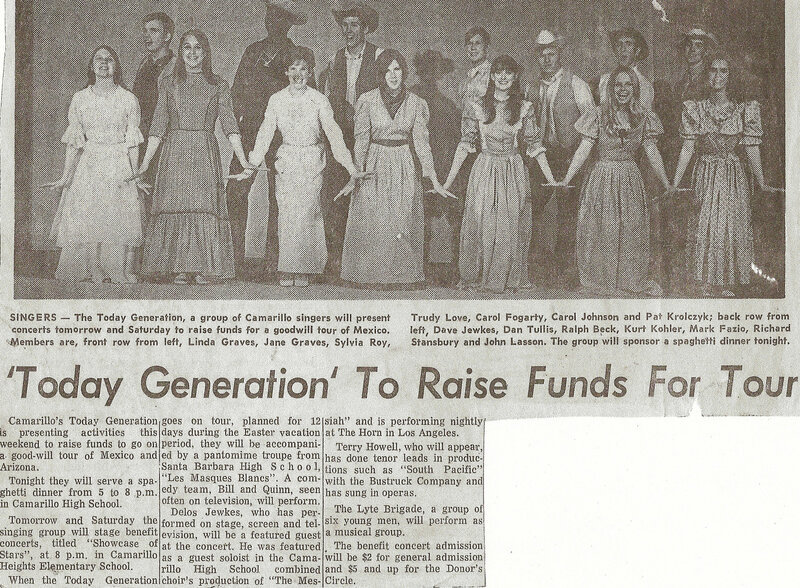 For our big concerts that featured show tunes there were also western or victorian costumes. In one of the newspaper articles about us it was said that over $5000.00 was spent on costumes alone in the course of a couple of years. I don’t recall being aware of the costs at the time. We had lots of professional help during these months. 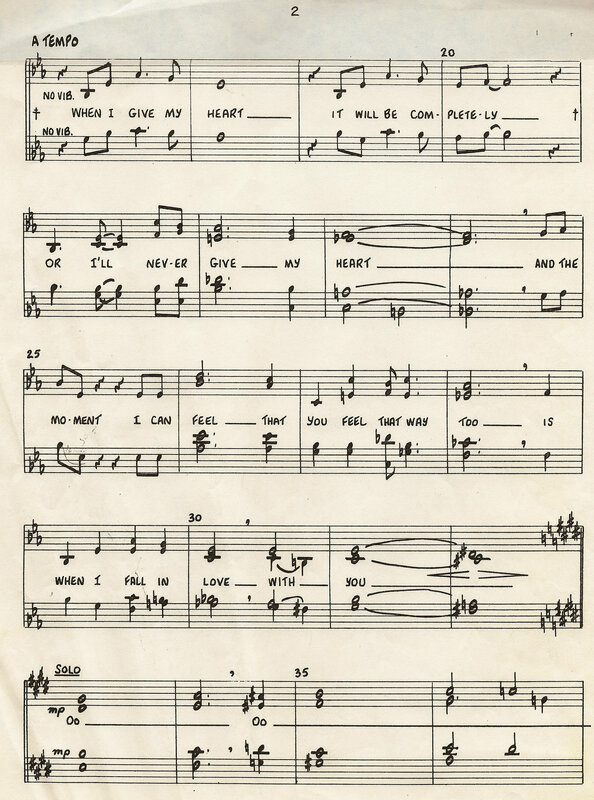 Professional arranger Phil Azelton wrote a theme song for us, and arranged several more of our performance pieces. David Evans, professional dancer and choreographer, donated his services as well. Dennis Wilkerson was often around, helping in so very many capacities. Professional musicians Luke Hall (bass) and Barry Zwieg (guitarist) accompanied us for many performances. Yes, we WERE gambling! We were in no way assured that we would raise enough money to go to Mexico, but we went ahead with plans anyway. It’s a testament to how much I loved being a part of the group and wanted to get in on absolutely everything possible, because I hate shots almost more than anything else in the world. But I did it. We all did it. And then we set about trying to raise enough money to make it happen. Lucky us! We got to do what we loved to do to raise funds to do what we loved. 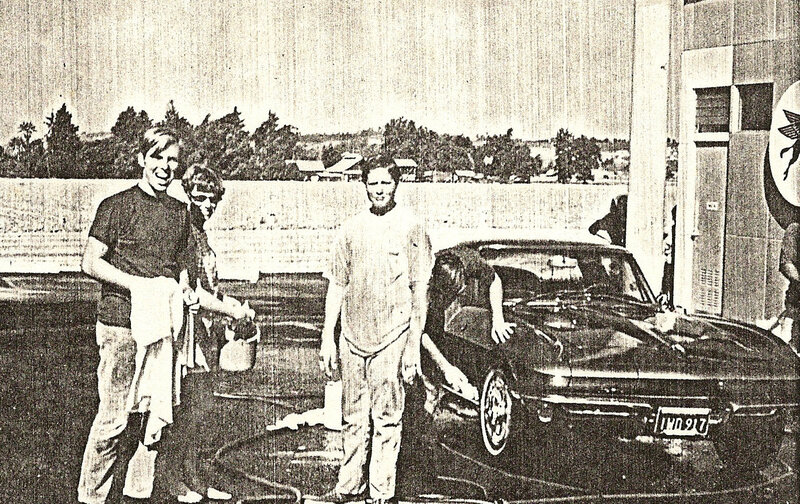 But don’t forget… the spaghetti dinners, the pancake breakfasts, and the car washes too! I remember this performance fondly. What happened was touching and emotional. It was starting to look like we weren’t going to make the money required for us to go on our Mexico Goodwill trip after all. But we still performed around town anyway. We were disappointed, but then we’d been there before…like the time it didn’t look like we’d make it to the California State Fair after all the planning and rehearsing we had done. We truly thought the preparations for Mexico (not to mention the shots!) had been in vain. And then we performed at the Camarillo Boy’s Club Benefit. The local businessmen who were attending really came through and showed their support of us. It was exciting. It was thrilling. And we were going to be able to go after all!! 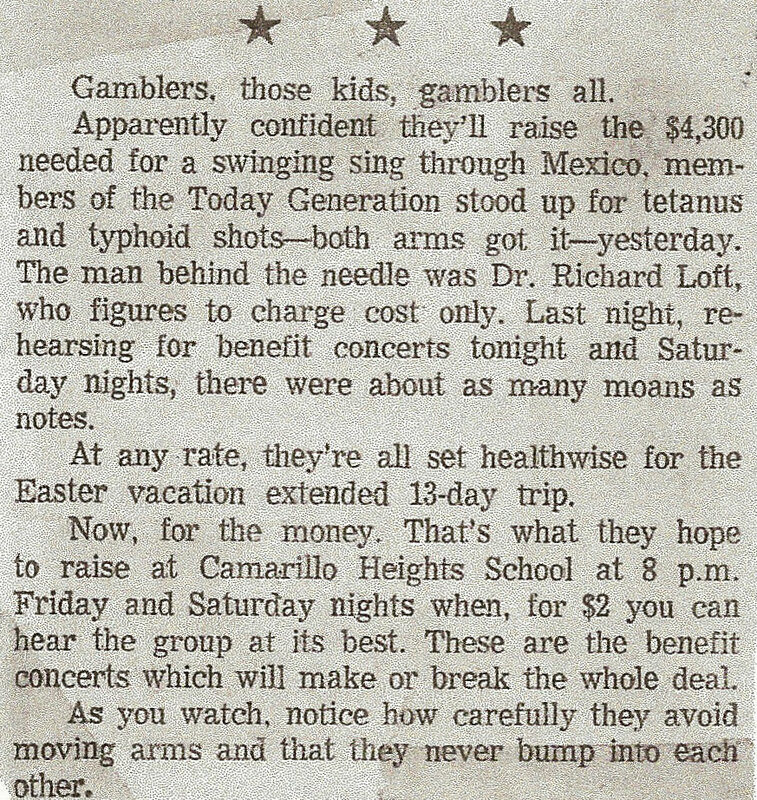 From my perspective now I have such great admiration and appreciation for how supportive Camarillo was of us. 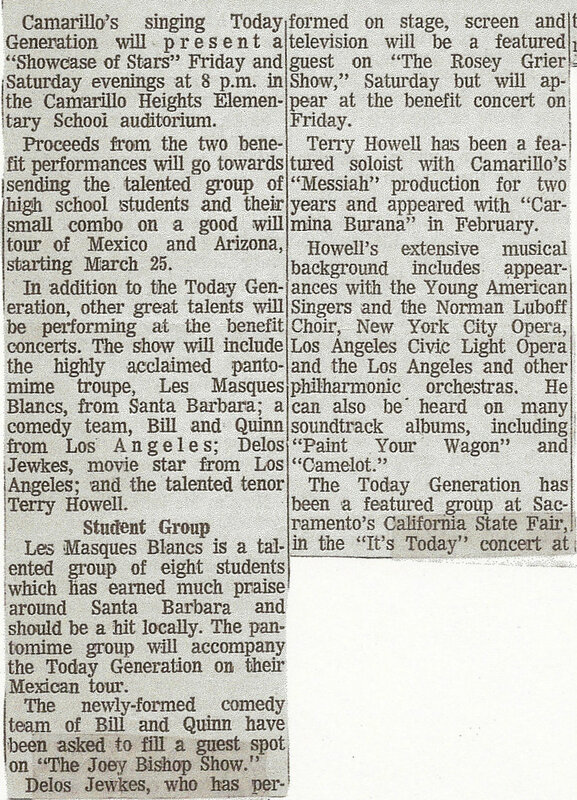 So after an incredibly busy month – a month declared by the mayor of Camarillo as Today Generation Month – we were finally assured that we were going to Mexico But first we had some concerts to do in California…. We were off – by bus! – on the Mexico Goodwill Tour. One of my favorite memories of the tour was when the bus broke down in the hot Arizona desert. We all piled out of it and waited…there were no such things as cell phones at the time. Cars that passed were few and far between, and the first one that actually stopped to see if they could assist was a VW beetle. We were highly amused at the thought of the 30 of us, along with our costumes, and equipment, climbing into the VW to continue on our way. I don’t remember the exact circumstances of our rescue, but since I’m here to tell the story I guess we eventually were rescued. We made it into Tucson, where we passed out flyers announcing our performances, performed, and had fun visiting Old Tucson! Then it was on to Mexico by way of Nogales. 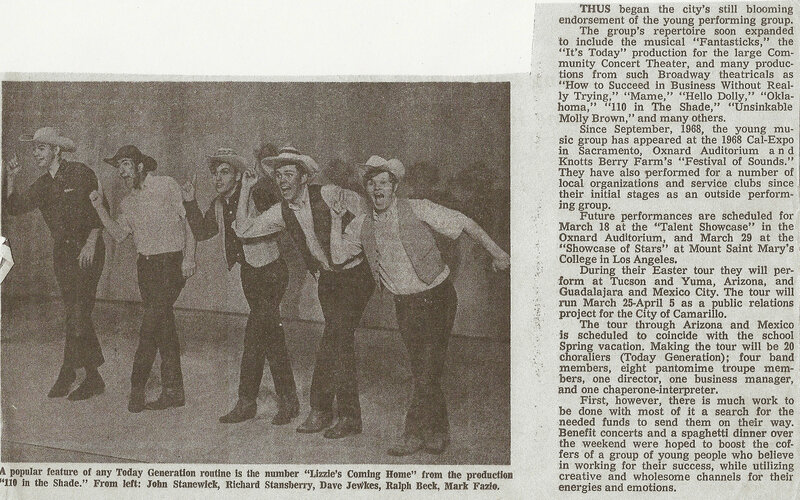 When we returned from our Mexico Goodwill Tour we were still busy…with school, many rehearsals for the finals of the Knott’s Berry Farm Competitions, graduation for many of us, and still more performances. 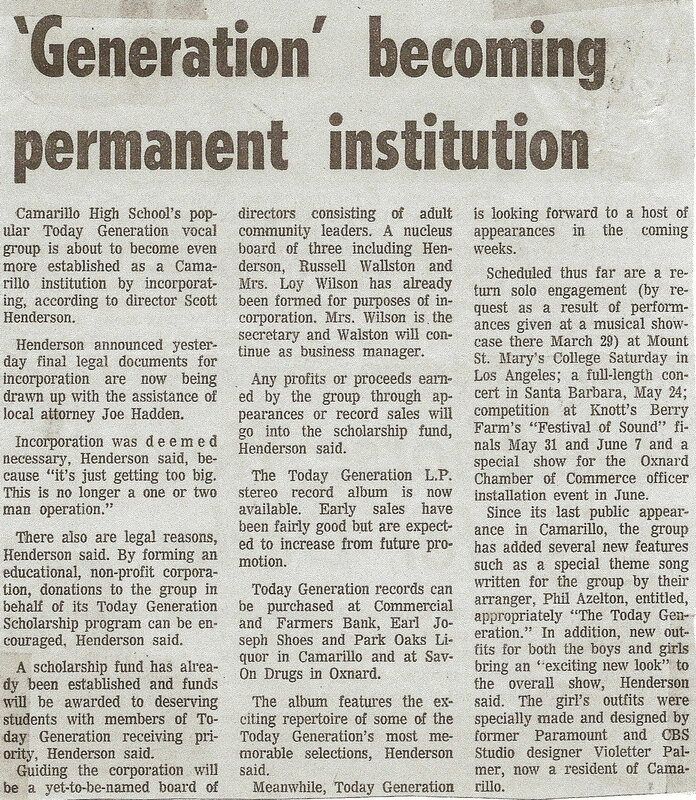 Meanwhile Mr. Henderson thought it would be wise to incorporate the Today Generation. 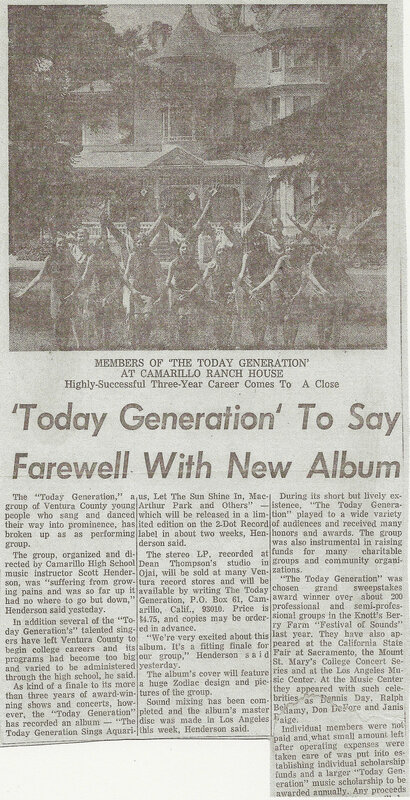 Right after graduation we performed in our biggest single concert to date: The Annual Oxnard Trade Club Show, which featured performers Dennis Day and Arthur Duncan as well. If you actually read the newspaper articles and letters to the editor, you’ll find a fair number of errors…including the name of our group. But I don’t want to be nit-picky. People were saying wonderful things about us and were extraordinarily supportive of our group. Other things that were publicized intentionally turned out to also not be correct, for instance some of our proposed performances. Let’s just say that Mr. Henderson was very much an optimist. He hoped to do a major production of Mame, for one thing. Things didn’t always work out the way he wanted them to, but it wasn’t for lack of trying on his part. And speaking of trying….his next big idea was to have a Fine Arts Workshop, a training ground if you will, for the next generation of uh, Today Generation-ers. 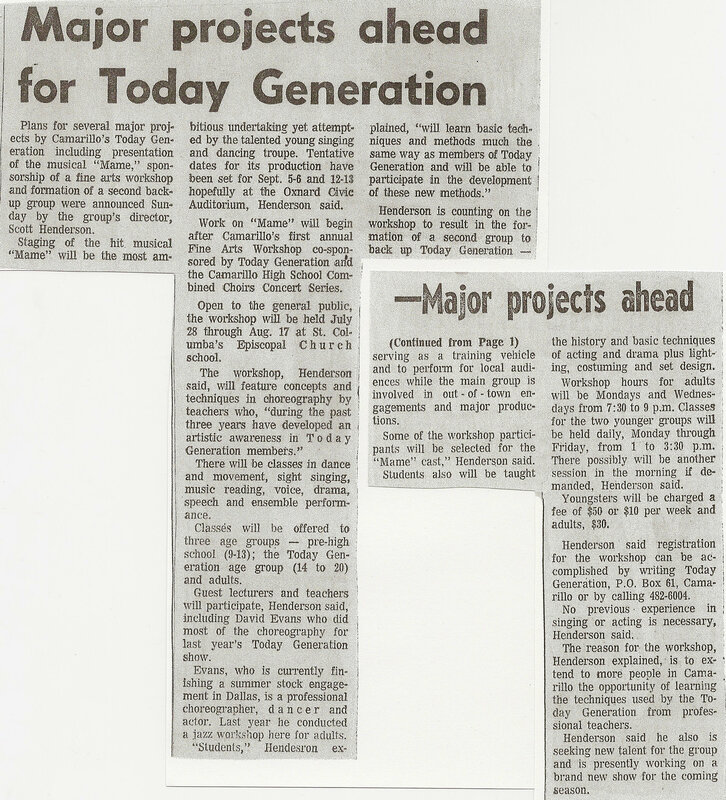 So he came up with series of classes that we would participate in during the summer of 1969. (It’s a little hard to explain and I’m not sure I understand it myself.) But there was a big spread int he Ventura County Star Sunday supplement talking about it…and us. He also had publicity photos taken of us. These include those of us who remained in the TG after high school, and the new members of the group who came in to replace those who had graduated and were off to college or into the service. Click here to see the article about the TG Workshop and photos. 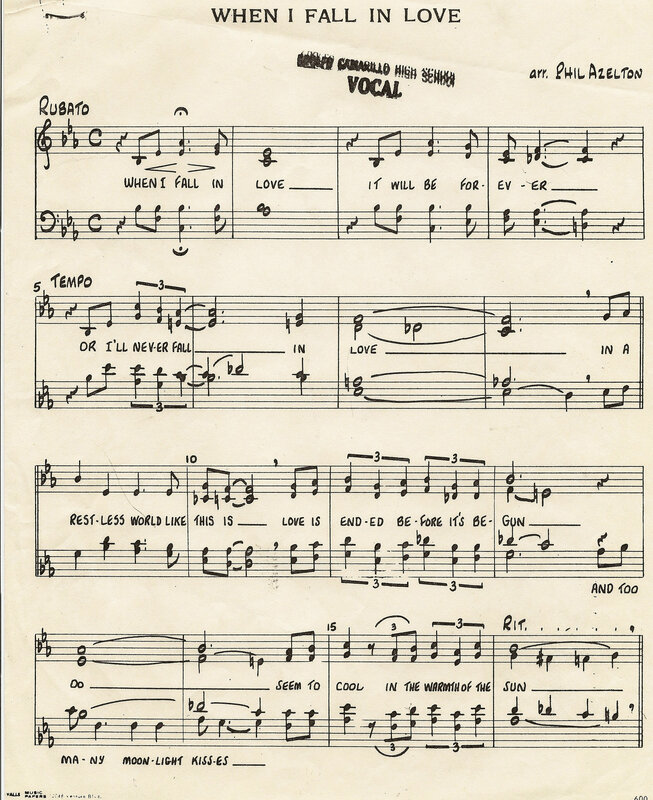 After the Fine Arts Workshop in the summer of 1969 there were a quiet few months with only rehearsals and small performances. 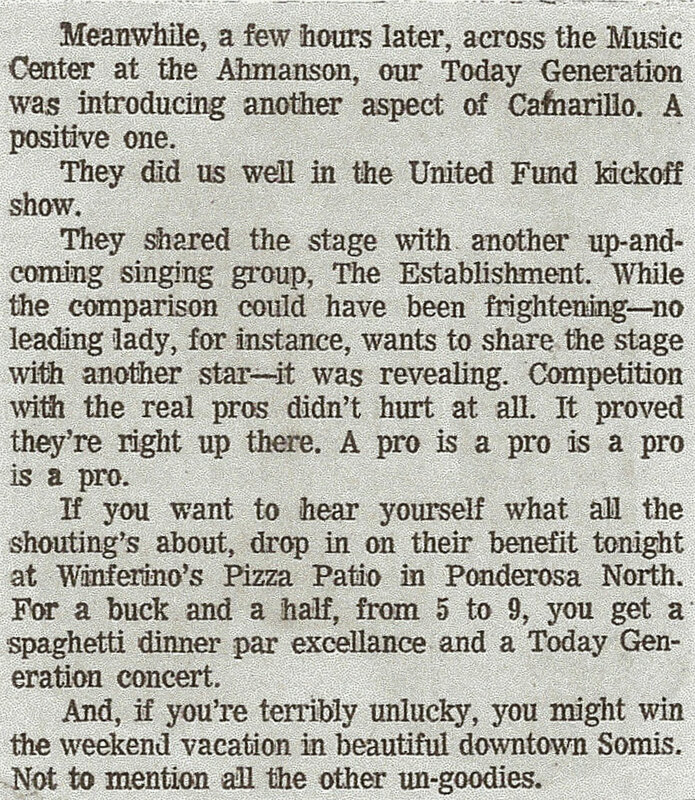 Then the Today Generation was privileged to be considered for an appearance at the Ahmanson Theater, at the Los Angeles Music Center, for a United Way Fund Kick-Off Show. Apparently, we were the second choice. No matter. We got the gig! Mr. Henderson had a quirky sense of humor (no doubt encouraged by the unique Kohler sense of humor). The next project we were involved in – right on the heels of the Ahmanson performance – was a “tongue in cheek” fund raiser called the Spaghetti Sweepstakes. This exciting event included a Miss Spaghetti pageant. (I can’t remember who “won”). 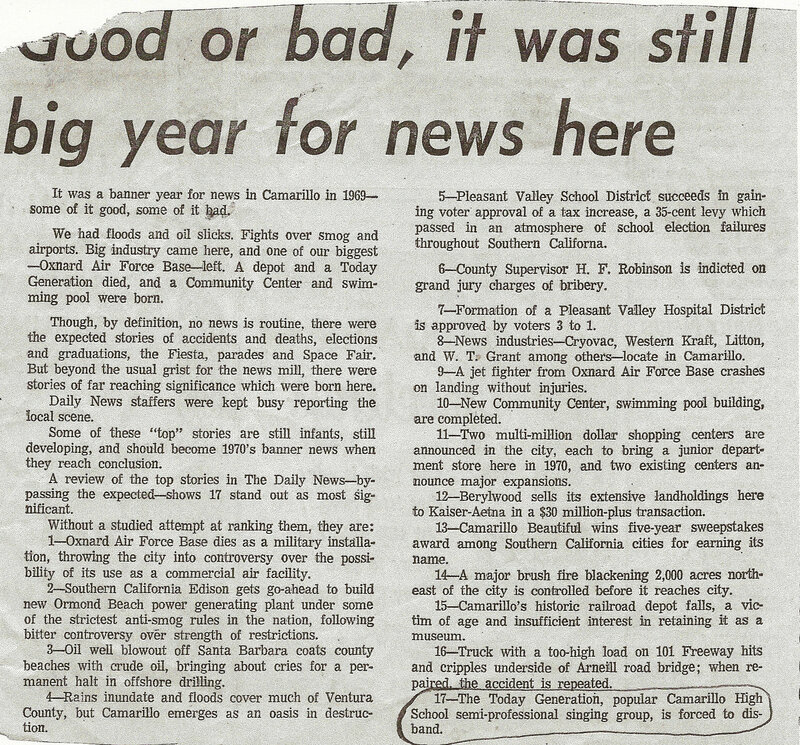 The grand prize was a vacation in downtown Somis. 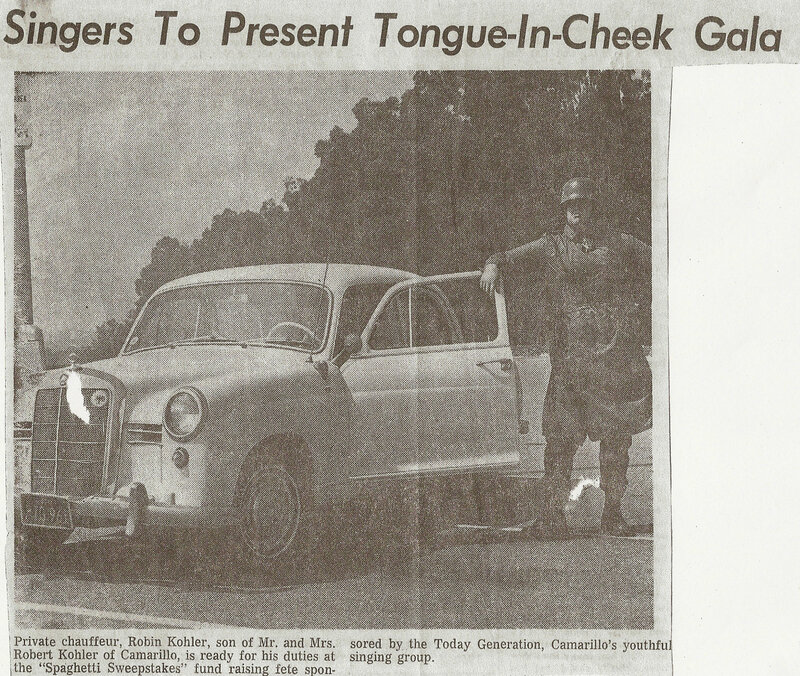 Another exciting “unprize” was a ten-mile ride in a(n old) Mercedes sedan, chauffered by Rob Kohler. Now THAT was a prize worth entering the sweepstakes for! Rob, who had been a member of the cast of West Side Story, was a frequent member of the orchestras Mr. Henderson put together for our performances, a good friend of Scott’s, and an all-around fun and funny guy to be around, as well as a good sport about participating in our unusual Spaghetti Sweepstakes event. Around this time the Today Generation was featured in a brochure for Shure microphones sound equipment. 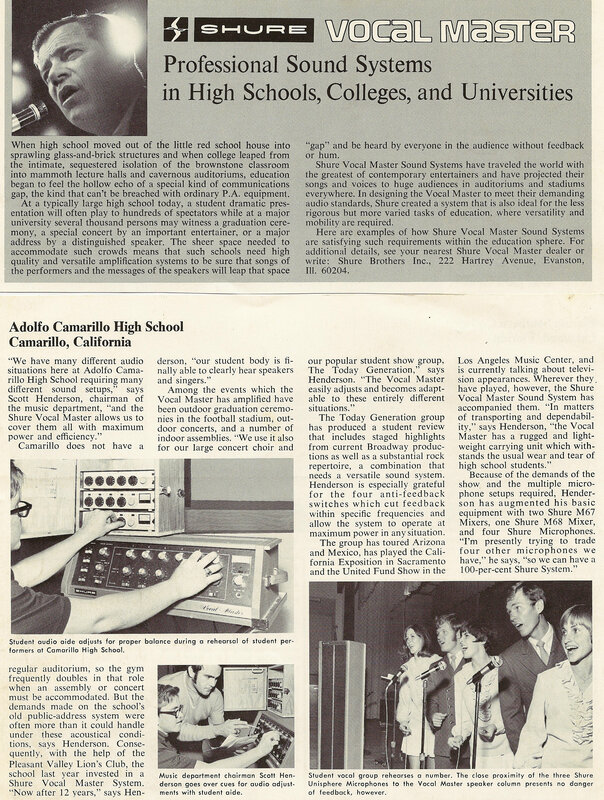 This brochure shows our own Bob Boles at the controls, as he always was when we performed. 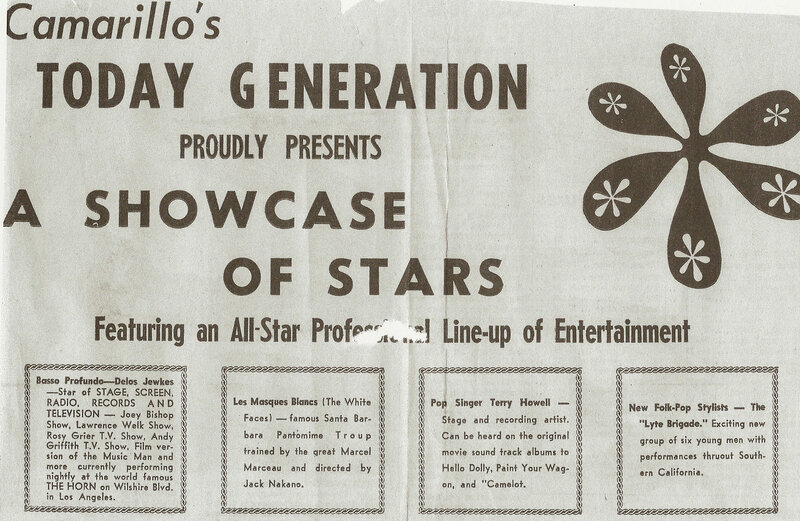 There was a reunion concert in the summer of 1970. Then it really was over. What an exciting ride it had been! I was and am so grateful to have been a part of the whole musical experience. But it wasn’t just the music. It was the performing, the fun, and most importantly, the friends, that made it so fantastic. It was the fact that Mr. Henderson was convinced we were capable of being better than we ever dreamed we might be, and then provided the leadership, the motivation, and the tools, (and again, the people) to make it so. As Bob Hope used to say….thanks for the memories. Trudy–You out did yourself–This website certainly has been worth all of your efforts. 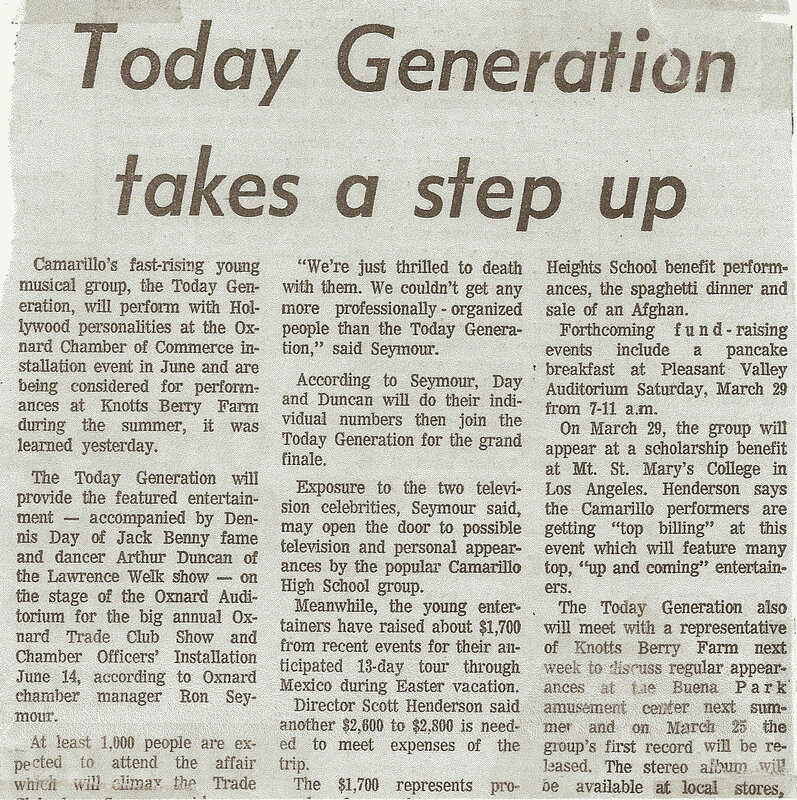 Even though I wasn’t a member of “The Today Generation”, I always felt proud to be a CHS student and then an alumni of CHS–giving me some association with this prestigous group. WOW…..this sure brings back some memories! I did not sing with you guys, but I sure do remember the memories from back then. Awesome website, and thanks for sharing it with all of us. 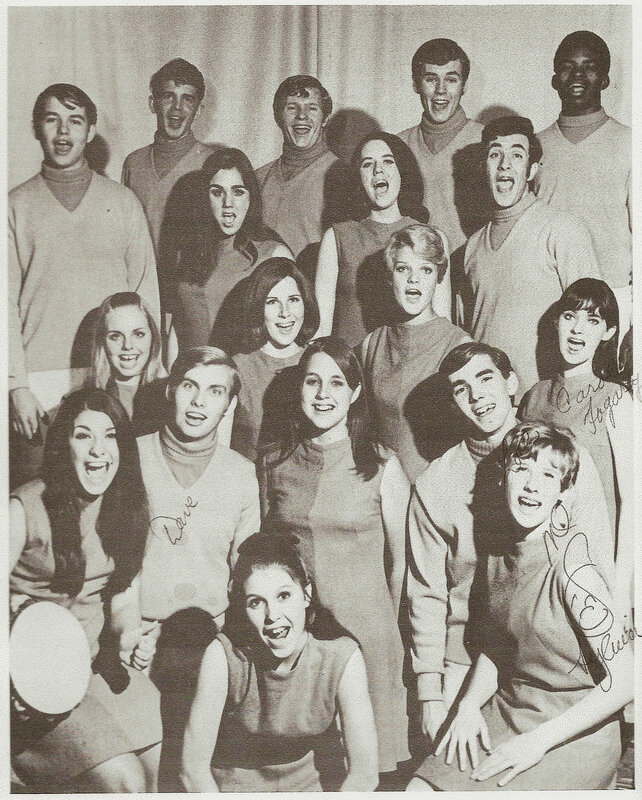 Oh those were the days… Scott Henderson and my Aunt Peg (Peggy Kohler, mother of Rob and Kurt Kohler) had so much Flo Zigfield and Buzby Berkley in them that they spurred each other on to envision incredible productions for the CHS music department. What a terrific experience of laughter, joy and music for all of those involved. What I wouldn’t do to relive those glorious days! Thank you Trudy for bringing it all back to life again! It is hard to believe the impact of these sweet memories and the impressions of a few short years has had on our lives. I am so glad to have been a part and fondly think of all my TG family more often than I would imagine – can anyone compare to the Glee phenomena of TV? Yes, I like to think that we were the Glee of our time. It just goes to show how far ahead of the curve Scott Henderson was. So many fantastic memories. I’m so grateful to have been a part of it. It always brings a smile to my face to remember those times! I got kicked out of this group early on by Scott Henderson when they were named the Chorleers for smoking cigarettes. Instead of Up Up and Away, it was Down Down and Gone for me. Ah… The good old days. Trudy, you did an awesome job of capturing an important time during our High School years. 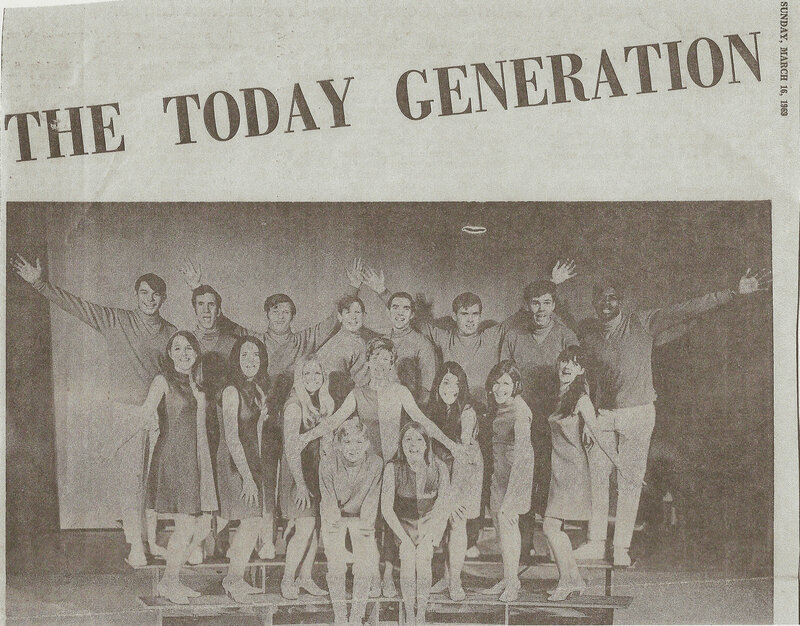 The Today Generation was an awesome talented group and congratulations to everyone who was involved with this great group. Love the addition of the music. Keep up the great work. Great job, Trudy. 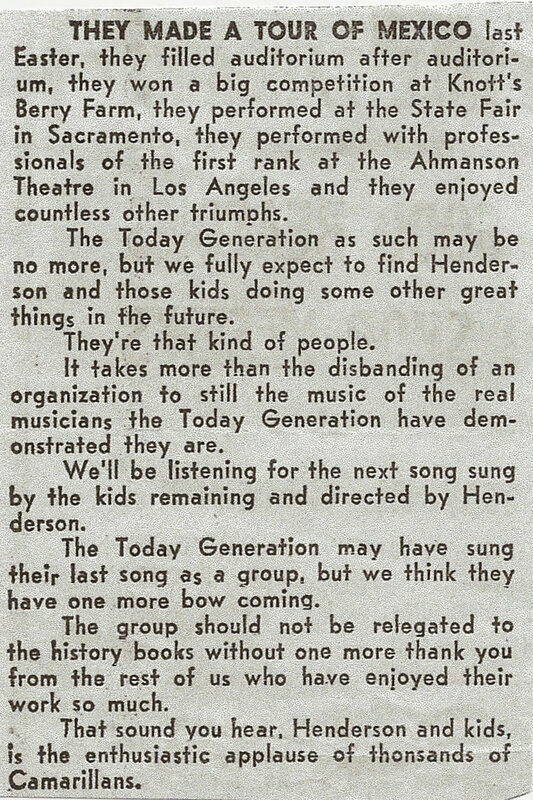 I loved the Today Generation and remember helping behind the scenes and singing all the songs at home. I wanted to be a part of it so badly, but was too shy to try out. 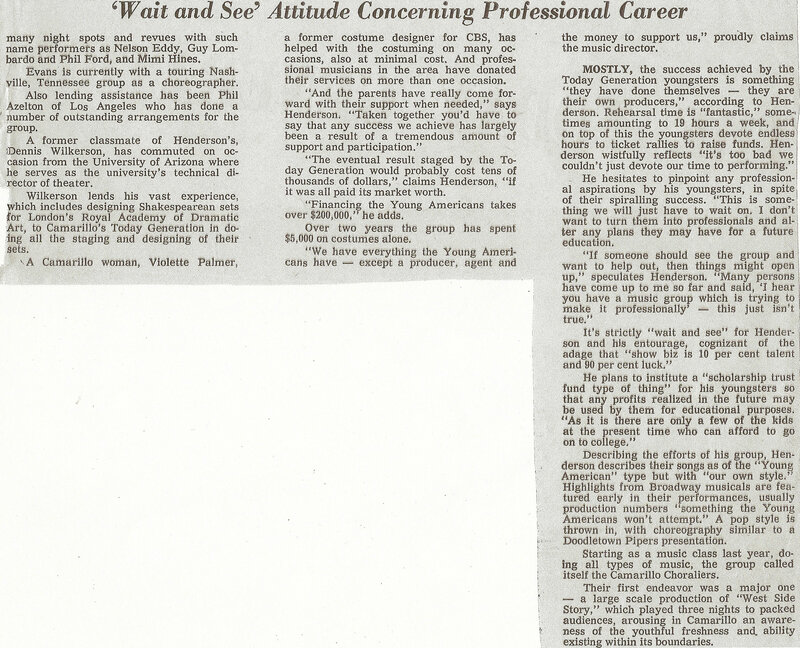 I have a lot of these old clippings and the LPs you guys made. What a time it was! Thanks so much, Kathy! I remember you well. I felt SO privileged to be a part of the TG and have enjoyed going back to those days and recalling it all. I’m pleased others are enjoying these bits of memorabilia as well! Well Trudy, You did a wonderful job (as Always). I believe you caught the essence of our group with all the clippings. This was one of the BEST times of my life, and knowing everyone in the group was one where we thought of each other not only as friends (which will last a life time), but as family as well. It made our High School closer but it also put it on the map during that time too. Like you Trudy, I was very privileged to be in this group, but also meet and perform with movie and T.V. Stars. Wow, what a life it was to experience.